Kristen Stewart and Cara Delevingne will also be starring in the campaign. 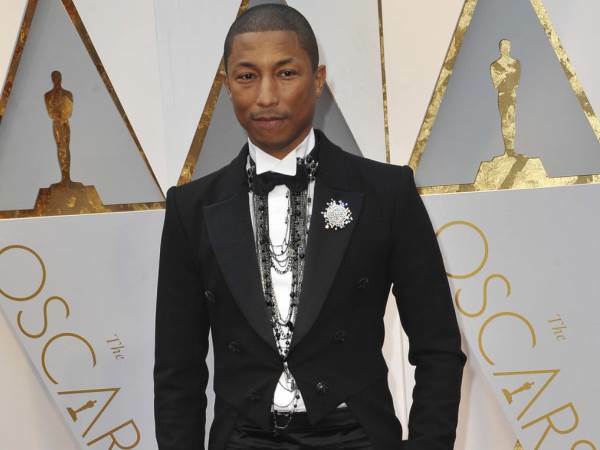 Pharrell Williams has made history by becoming Chanel's first bag campaign male model. A short film featuring the Happy singer dancing around in an empty concert hall and strutting his stuff while promoting the brand's newest Chanel Gabrielle bag was released by the French fashion house on Monday. The Grammy winner also appears to walk on a precarious beam in mid-air, nearly dropping the high-end handbag as he attempts to regain his balance. The 44-year-old was announced as the first ever frontman of a Chanel handbag campaign in March, just months after he walked the catwalk for the iconic label's Metiers d'Art runway show in Paris in December. Creative director Karl Lagerfeld unveiled the handbag project exclusively to WWD, noting actress Kristen Stewart and model-turned-movie star Cara Delevingne will also be starring in the campaign along with French star Caroline de Maigret. Karl specifically chose Pharrell to promote the Gabrielle tote to emphasise to fans the bag can be worn in “many different circumstances” by different people. “It’s not very feminine in the sense of being chichi," Karl stressed. Pharrell is all the rage in France's fashion scene at the moment - last month he was awarded the prestigious Officier des Arts et des Lettres Award by French Minister of Culture Audrey Azoulay, who honoured the star for his contribution to the arts in a ceremony held during Paris Fashion Week. The musician previously gushed about the unlikely enlightenment he has attained through his participation with high fashion. “I was like a nerdy little black kid on a skateboard. So looking at high-end fashion was something that I really didn’t understand in the very beginning,” he told WWD. “And then I realised, slowly but surely, man, this is amazing. And although there’s mostly the perception that it’s for women, I just started to see, 'OK, as a man, I can wear some of this'."